Every year, the Cooper Center produces the official population estimates for the commonwealth of Virginia. The estimates are based on changes since the 2010 census in housing stock, school enrollment, births, deaths, and drivers’ licenses. The estimates are used by state and local government agencies in revenue sharing, funding allocations, planning and budgeting. This year’s estimates show that Virginia’s population grew by less than 1 percent between July 2012 and July 2013 to 8,260,405, the slowest growth since before the recession began. Between 2010 and 2013, Virginia’s population has grown 3.2 percent. While the number of births has fallen in recent years, the recent decline in Virginia’s growth rate was caused largely by fewer people moving into the state. Since 2010, the Loudoun, Fairfax, Prince William, and Arlington counties, and the City of Alexandria have grown more in population than the rest of Virginia. As Virginia’s population growth rate fell after the recession began, the share of Northern Virginia metro area’s growth actually increased. The chief cause of diverging growth rates is perhaps due to the sources of growth. Recent growth in Northern Virginia is caused largely by more births than deaths, and less by migration. When migration fell, Northern Virginia was less affected than the rest of Virginia. The fastest growth occurred in Fredericksburg (15.1%), followed by Loudoun (11.4%), and Arlington (9.4%). Noticable increases in growth rates have characterized urban areas since the beginning of the recession, and this trend will be examined more in a future post. Overall, 7 of the 10 localities with the highest percentage growth were in Northern Virginia. In contrast, most localities with declining populations were located outside of the urban crescent. Southwest and Southside Virginia were particularly affected, with all 7 coal producing counties experiencing a decline in population between 2012 and 2013. A report we produced last year showed that many rural localities in Virginia with natural decrease, such as Halifax and Grayson counties, have more people moving in than those moving out. The inward migration in those localities, however, is not making up for losses from natural decrease. 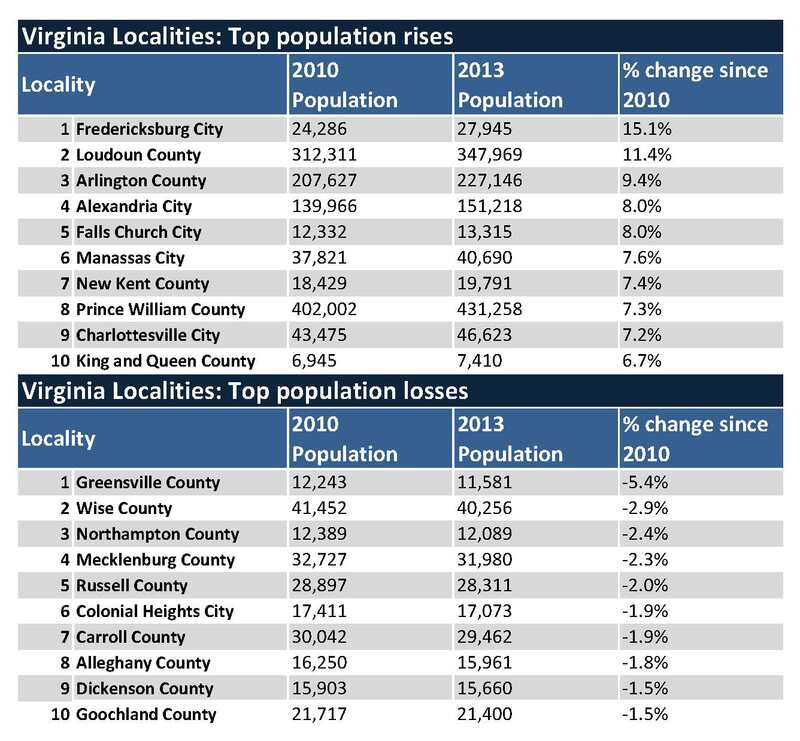 Between 2010 and 2013, thirty-three localities in Virginia lost population, even while fifteen of them had more people move in than out. For the 2013 estimates by locality, please click here.